Welcome to Week 3 of our series: Analytics Tip Of The Week. How do I get my traffic? 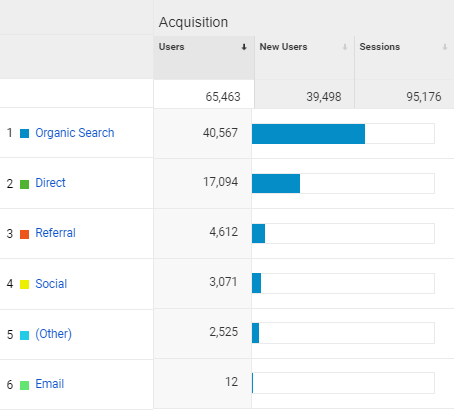 Without a doubt, one of the most viewed metrics in Analytics is the Acquisition section – where traffic to the site comes from. But like most of Analytics, it helps to understand some items when viewing these reports. Organic Search: Coming from a search engine, such as Google or Bing. Social: Traffic that comes from social media, such as Facebook, Twitter, or Instagram. Email: Clicks from an email message. Affiliates: Some companies pay websites a commission when traffic is sent. If your site has this arrangement, the visitor will be noted in this category. Referral: A click from another website not already covered above. Paid Search: Traffic generated through Google Ads or similar online advertising. Display: Clicks from display advertising, such as purchasing a banner ad on another website. Direct: Traffic generate when someone visits your site by typing it directly into the browser or through a bookmark. These categories are use two items called the Source and Medium to determine the Channel to which the visitor belongs (these will be covered in a later post). They are a great indication of where your traffic comes from, and can be used to evaluate whether your marketing efforts are being successful. It is important to note that Channel tracking is not perfect. Although Google Analytics does its best to figure out where your visitors come from, it can’t always tell. Even though another website may have a link to yours, sometimes that information does not get passed through. It is possible to override this information. Quite often, visitors get lumped into Direct traffic when they belong elsewhere. And, unfortunately, it’s even possible to trick your website into reporting inaccurately. But despite the challenges, this is one of the most useful reports you’ll find in google Analytics, especially if you track changes in your traffic patterns over time.